Woodbarton is a hidden artistic jewel in the heart of Sussex. The house is being offered for sale on the open market for the very first time since it was built in 1920. It was designed and decorated by the famous Ditchling based artist, Eric Gill (1882-1940). Eric Gill was born in Steyning, West Sussex, in 1882. In his formative years he lived both in Brighton and Chichester. In 1900 he moved to London to train as an architect with the firm W. D. Caroe. Gill became ever more disaffected with this path. He studied stonemasonry in Westminster and calligraphy at the Central School of Arts and Crafts. By 1903 Eric Gill had given up his architectural training to become a calligrapher, letter-cutter and monumental mason. In 1907 Eric Gill found himself drawn back to Ditchling in Sussex. Together with a group of fellow artists Gill worked within the Roman Catholic Guild of St Joseph and St Dominic at Ditchling. 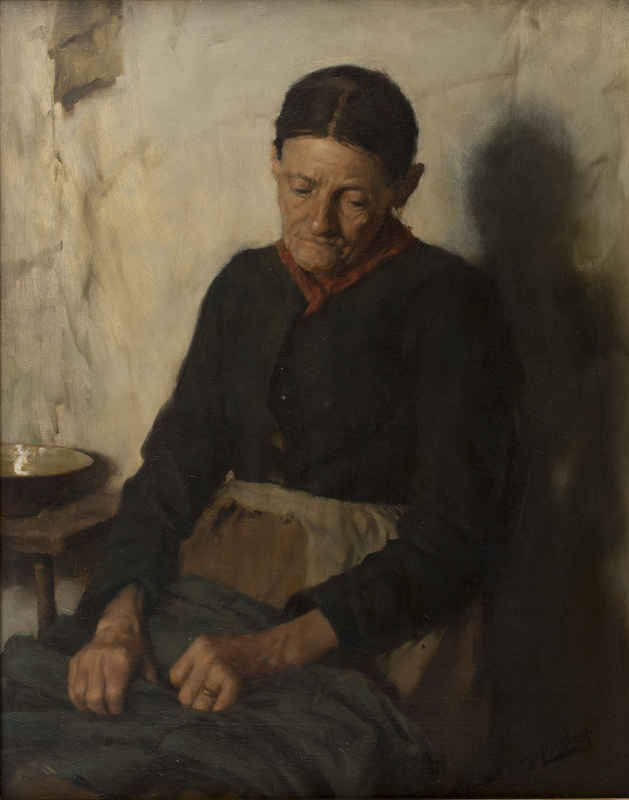 These artists lived in community with their wives, children, associates and apprentices. They upheld the principles of the artisan artist. Their work and lives were framed by the monastic rhythm of prayer. Thanks to their work this Sussex village became a centre for the Arts and Crafts Movement. The Guild of St Joseph and St Dominic was founded by Eric Gill, Hilary Pepler and the English poet and artist, Desmond Chute (1895-1962). Eric Gill brought his artistic and architectural skills to bear when he designed Woodbarton for his associate Desmond Chute. The house sits confidently in its generous gardens, surrounded by open countryside with stunning views. An old brick path leads past the studio to a welcoming front door which, it is thought, might be the work of the Arts and Crafts designer and architect, Ernest Gimson. 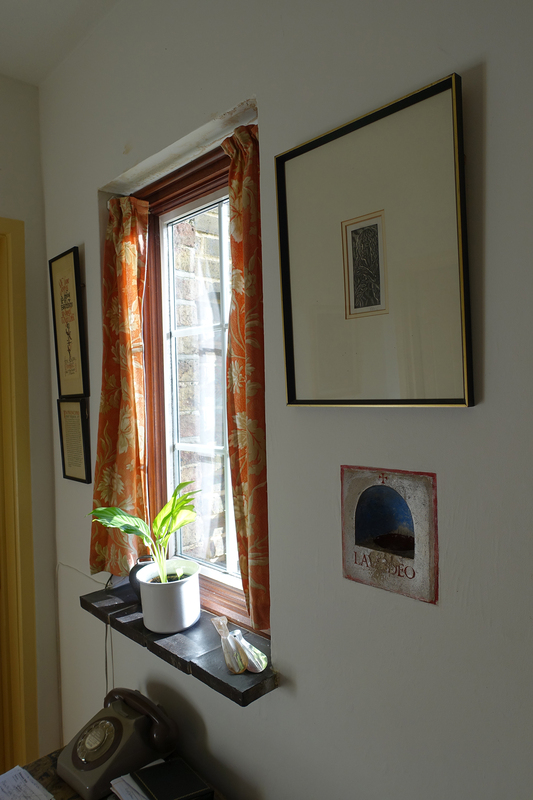 That this home was designed by the artist Eric Gill for an artist becomes quickly apparent as the light breaks into the generous hallway. The qualities of light and welcome run through the whole house. 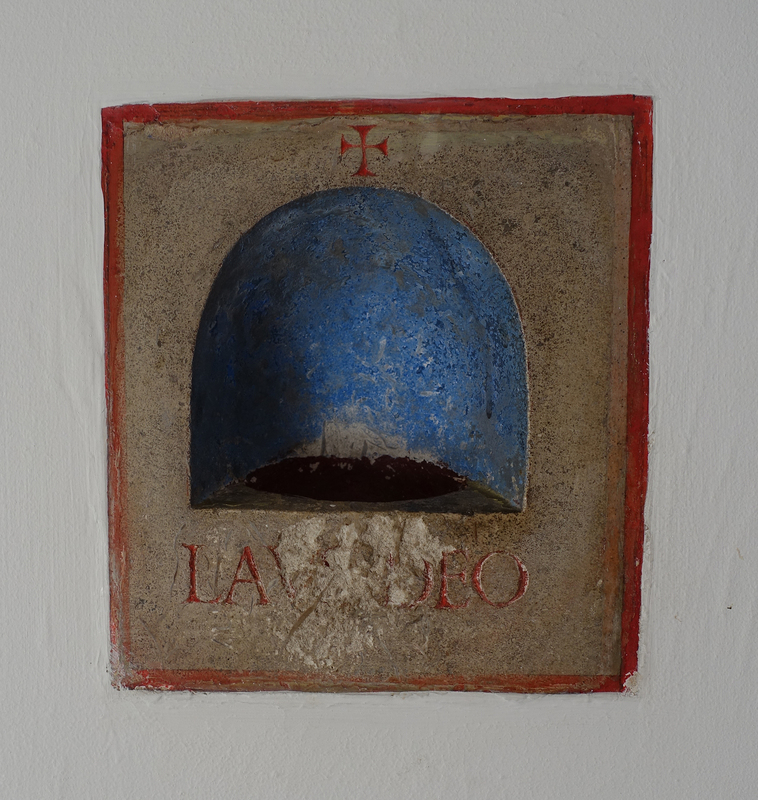 The Christian foundations of the Guild of St Joseph and St Dominic is visible in the carved and painted stone Lavabo by Eric Gill, which is set into the hallway’s wall. It would have contained Holy water for a priest to ritually wash as a sign of inner purity before celebrating the Mass, and for members of the Guild and visitors to bless themselves. The sitting room is arranged around a fireplace which is framed by a stone carving with a central cross, again by Eric Gill. 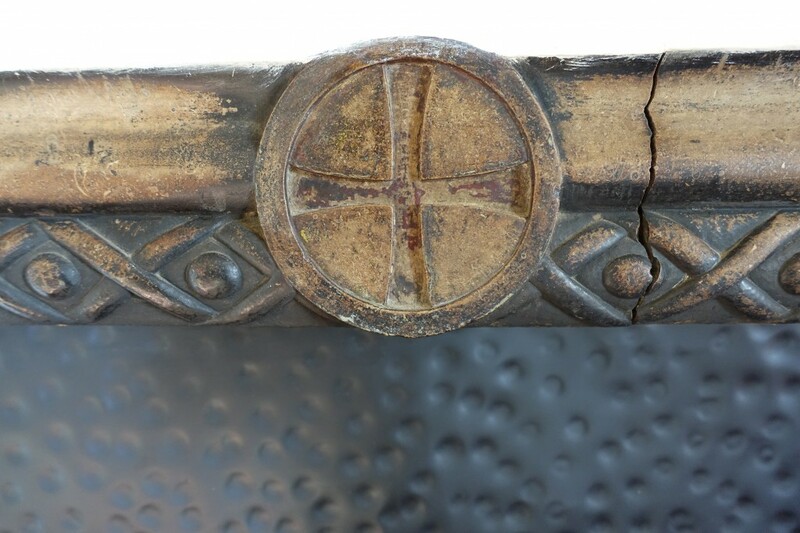 The stone was originally made for Westminster Cathedral where Gill carved the Stations of the Cross. It was broken in transit and was therefore installed at Woodbarton. 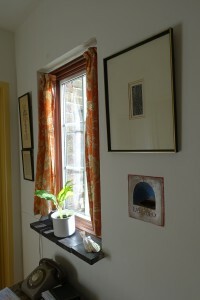 There are stone panels carved with meditative inscriptions by Gill and others set into some of the walls of the house. Desmond Chute only lived at Woodbarton for a few years before leaving for Rapallo in Italy for his health. Chute would be ordained as a Roman Catholic priest in 1927. After he left, the house became the home of the Guild’s treasurer, Eric Gill’s brother-in-law, Charlie Walters and subsequently the weaver, Valentine Kilbride. In 1983 the Guild was wound up and Woodbarton was bought privately by the artists, Edgar and Jennifer Holloway. When they arrived there was no plumbing and only an outside toilet and single cold water tap. This artistic couple set about modernising the house to create the comfortable home and studio, in which to live and work, which you see today. With its three bedrooms, reception rooms and studio the fortunate buyer of Woodbarton will acquire a generous and charming home. This exceptional house forms part of an important story in the history of both the Arts and Crafts Movement and Modern British Art here in Sussex. It provides a remarkable opportunity to live with exceptional art-in a beautiful setting. 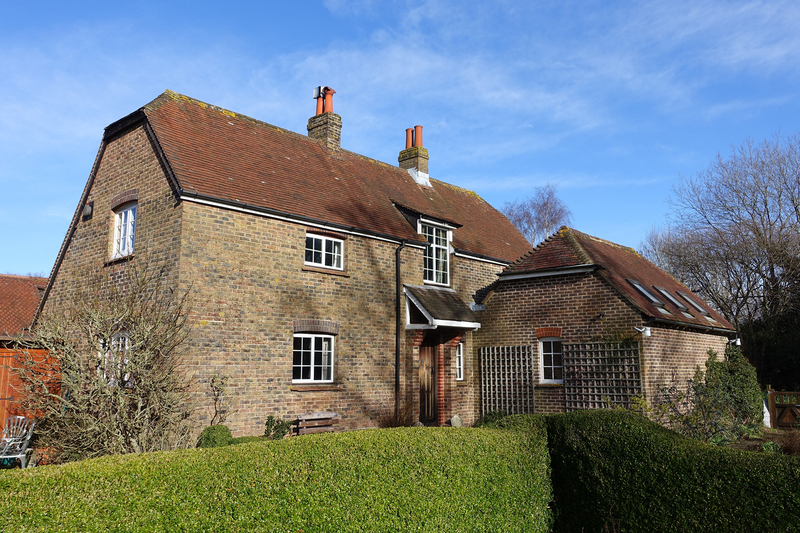 The property is being marketed by Clifford Dann with a guide price of £800,000. Partner, Michael Hudson, understands the importance and qualities of this unique property. For more information contact Clifford Dann’s Ditchling office on 01273 843344 or email ditchling@clifforddann.co.uk. 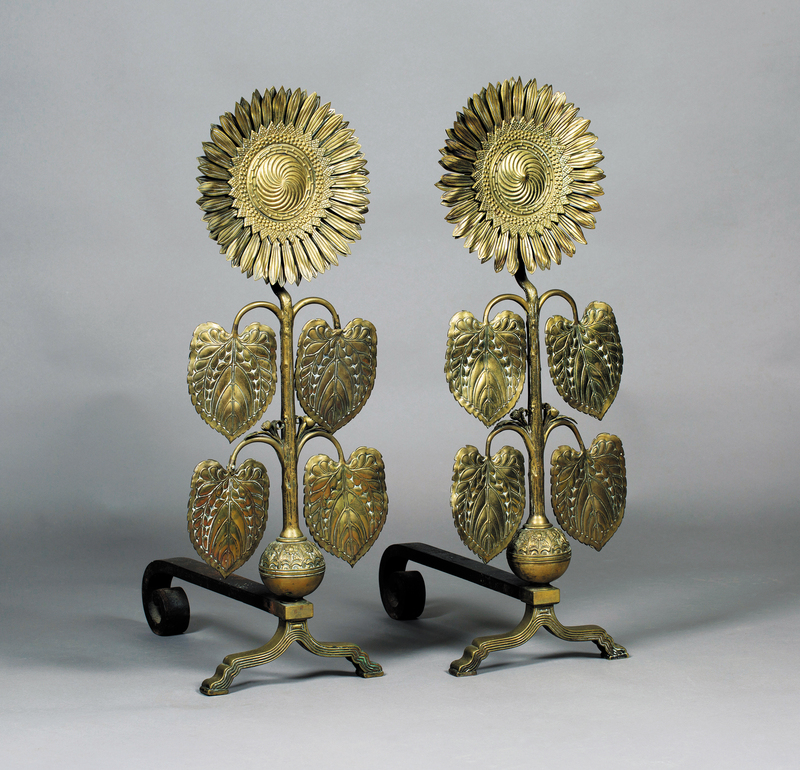 This week’s column is, in part, inspired by the remarkable discovery of a rare pair of Sunflower Andirons attributed to the Aesthetic Movement designer, Thomas Jeckyll (1827-1881), which are to be sold at Toovey’s in West Sussex. Since the 1860s designers and potters in Britain and America have fallen under the influence of the Japanese aesthetic. The influences of Japanese culture and art joined with the theories of ‘art for art’s sake’ promoted by influential European writers, poets and critics like Théophile Gautier and Charles Baudelaire. Their thinking promoted artistic expression without edifying, moral or utilitarian purpose; rather it was bound up with a sense of human self-determination and inner-direction. It resulted in the Aesthetic Movement in Britain and America. At the forefront in Britain was the American born, British based, artist James McNeill Whistler and Oscar Wilde. Thomas Jeckyll worked as an architect and designer and was part of the Aesthetic Movement in Britain. He was commissioned to design a dining room as part of the remodelling and redecoration of Frederick Richards Leyland’s home in London. Leyland had made his fortune as a British shipping magnate. Jeckyll conceived the room to display porcelain in the Anglo-Japanese taste. Despite his undisputed gifts for architectural design he is predominately celebrated for his ironwork. The sunflower features prominently in his designs. A pair of the rare Sunflower Andirons by Jeckyll can be seen in the fireplace of the famous Peacock Room from Leyland’s house. They are very similar to those entered for sale at Toovey’s. These andirons have been described as ‘an exquisite example of the Anglo-Japanese style’. 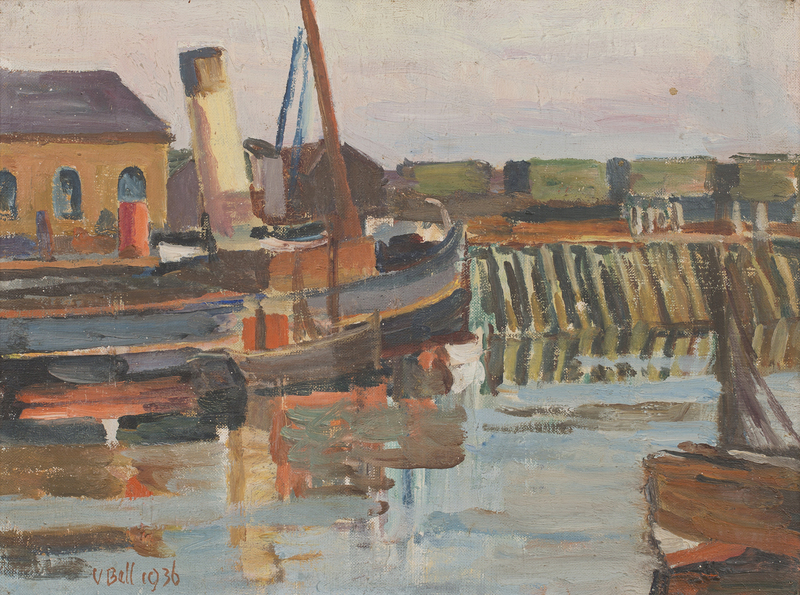 As with many of Jeckyll’s pieces they were made by the Norwich firm, Barnard, Bishop & Barnard. The Peacock Room acquired its name after the artist James McNeill Whistler overpainted the Jeckyll designed dining room. Between 1876 and 1877 Whistler, inspired by the Chinese porcelains contained in the room, turned it into a masterpiece of mural art painting. He employed a rich, unified palette of over-glazed and gilded brilliant blue-greens. It is considered by many to be the finest surviving Aesthetic Movement interior in the world. Charles Lang Freer purchased the Peacock Room and in 1904 shipped it from London to his Detroit Mansion where it was reconstructed to display pots in his collection from Egypt, Iran, Japan, China and Korea. The Peacock Room is now on display, together with his collection, in The Freer Sackler, The Smithsonian’s Museum of Asian Art, in Washington D.C. The influences of the east, especially Japan, also became apparent amongst studio potters from the later 1860s. This influence continued into the 20th century in the work of British potters like Wally Keeler (b.1942). 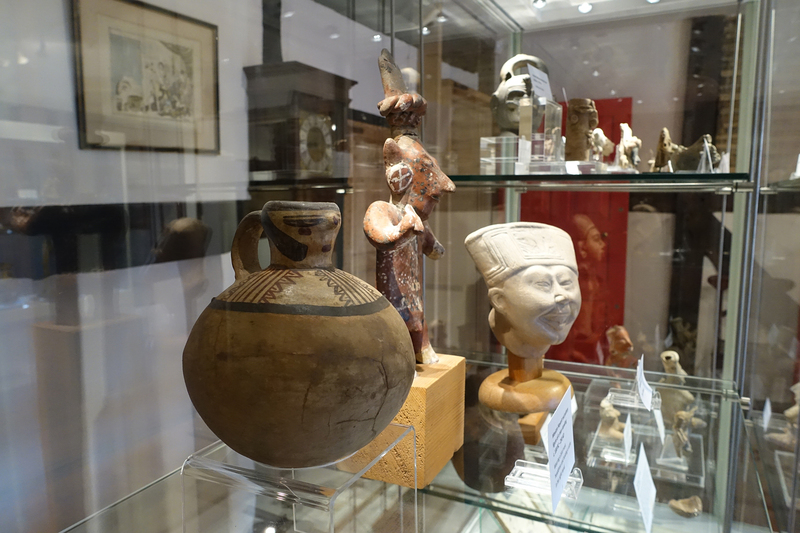 Toovey’s Arts and Crafts specialist, William Rowsell, explains that a collection of Keeler’s work, and pieces by other leading studio potters, have also been consigned to Toovey’s for sale. Keeler led the revival in salt-glazed wares. 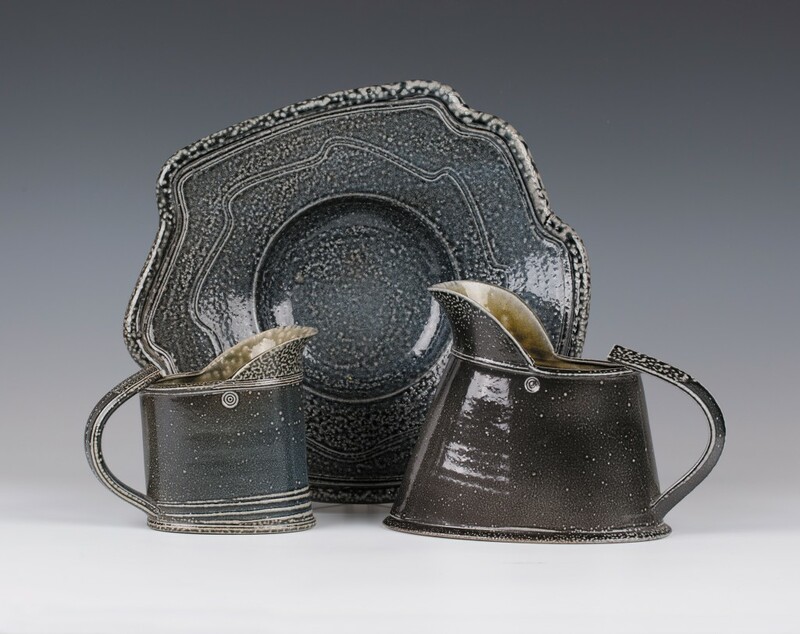 The combination of his very fine throwing, craftsmanship with his exemplary sense of form is apparent throughout his work and is displayed in the jugs and dish illustrated. The forms are beautifully accentuated by the pitted, coloured salt-glazes he employs. Toovey’s forthcoming specialist sale of Arts and Crafts Furniture and Works of Art and British Studio Pottery will be held on Tuesday 29th March 2016. William Rowsell, is excited by the Studio Pottery and the potential result of the important Aesthetic Sunflower Andirons designed by Thomas Jeckyll which are expected to realise between £10,000 and £20,000. Entries for this exceptional sale are still being accepted. William Rowsell will be delighted to offer free advice on your Arts and Crafts furniture, objects and Studio Pottery whether you are considering selling or buying. Telephone Toovey’s on 01903 891955, or email auctions@tooveys.com, to arrange an appointment. By Revd. Rupert Toovey. Originally published on 3rd February 2016 in the West Sussex Gazette. Last Thursday evening I found myself at Petworth House for the opening of ‘Remastered: Bosch to Bellotto’ –it is a ravishing display. Rarely do you encounter an array of art as remarkable and exciting as this exhibition of European Old Masters. It reunites rare, unseen masterpieces, loaned from the private collection of Lord Egremont, with paintings from the National Trust’s collection at Petworth House. This jewel like show is woven together by a coherent and strong narrative which gives an insight into the passionate collecting tastes and connoisseurship of the Earls of Egremont over many centuries. The gallery display gifts us with the opportunity to examine the familiar and the new with a rare intimacy. It allows us to delight in the paintings in the way that these gifted patron collectors must have done as they acquired them. The show continues in the house where the paintings are in their natural setting, forming part of the decorative scheme at Petworth House, alongside furniture and objects. The exhibition is once again the inspiration of Andrew Loukes, Exhibitions Manager at Petworth House, who continues to break new ground at the National Trust by adding serious in depth exhibitions to the already rich experience of the visiting public. 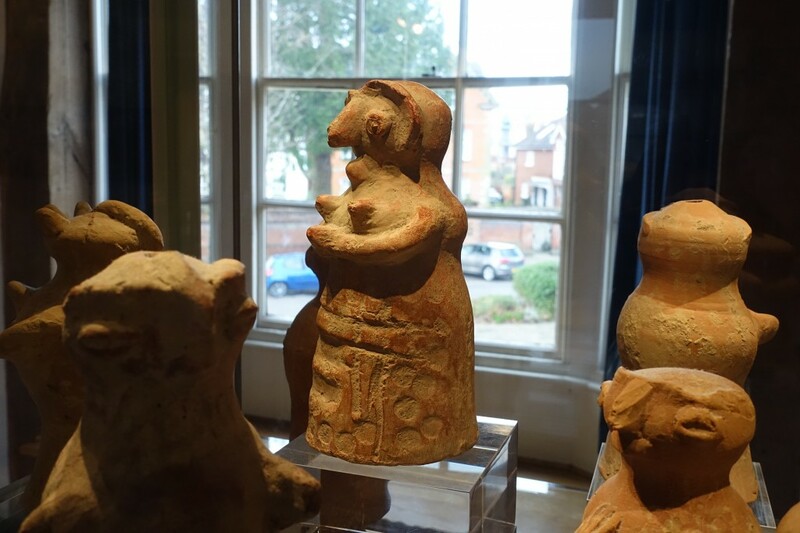 The importance of this exhibition was affirmed by the National Trust’s Central Curator of Pictures and Sculpture, David Taylor, who opened the show. 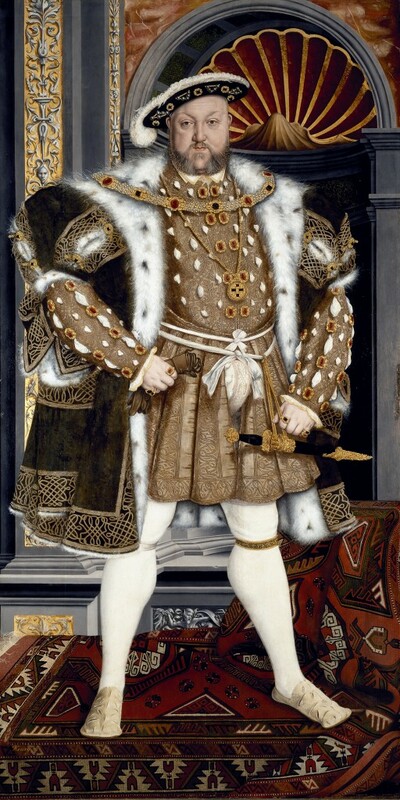 As you enter the gallery space your eye is immediately drawn to the iconic, seemingly life size, portrait of Henry VIII painted towards the end of his reign in the studio of Hans Holbein. It was placed in the panelling of the Carved Room, by the 3rd Earl of Egremont (famous as the patron and friend of the artist, J. M. W. Turner) in the early 19th century. 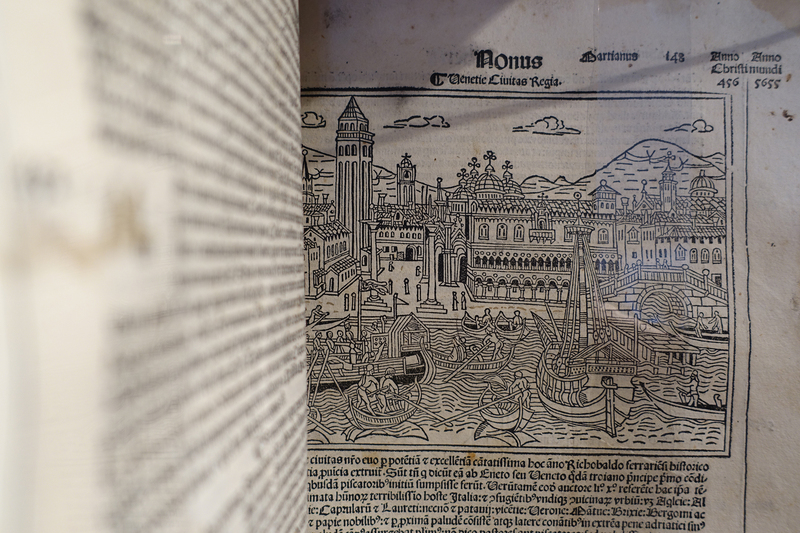 The picture’s usual setting does not allow you to experience the passages of real beauty in the details. The finely painted hair displays grey in this older monarch’s beard. There is a real sense of metal in the swords hilt and ruby encrusted chain. As you stand in the presence of this painting you feel that if you dared to breathe the delicate, lifelike ermine would move. Andrew Loukes explains that the painting was almost certainly commissioned by Edward Seymour who was very close to Henry VIII in the latter part of his reign and acted as guardian to his sister’s son, Edward VI, during the young King’s short reign. His family’s connection with Petworth through the 6th Duke of Somerset, Charles Seymour (1662-1748), may well have brought his important painting to the collection. 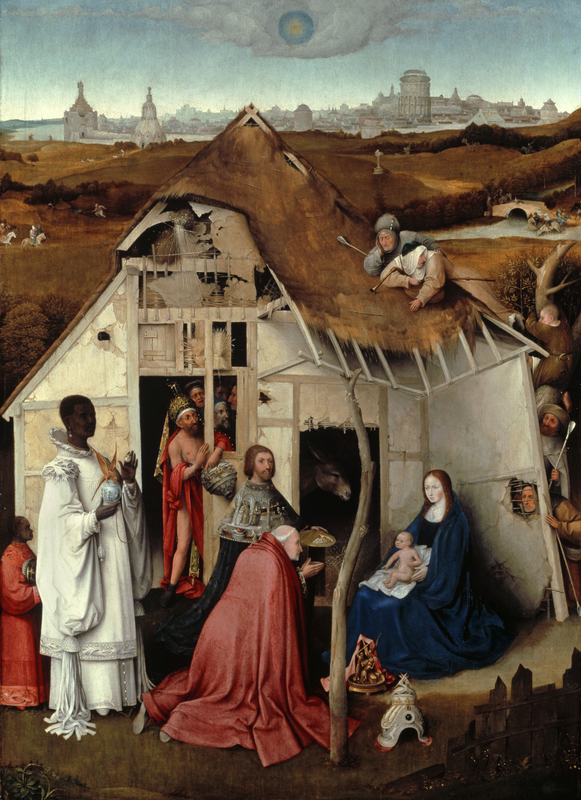 To your left is the remarkable Adoration of the Magi, attributed to Hieronymus Bosch and leant by Lord Egremont. Painted around 1515 it is thought to be a version of the central panel of the great triptych now at the Prado in Madrid. It is a work which commands the attention of the viewer as layered meaning and exquisite details reveal themselves. Academic opinions vary but the gold sculpture, Jaspar’s gift, appears to depict the sacrifice the prophet Isaac, foreshadowing the death of Christ. Behind the kneeling Jaspar stands Melchior whose cape depicts King Solomon receiving gifts from the Queen of Sheba. To the left is Balthazar wearing white and bearing myrrh. That the figures in the landscape beyond wear northern European costume against the imaginative backdrop of Jerusalem. Look out for the owl in the rafters too! After his success with Mr Turner last year Andrew Loukes has done it again! That he has provided us with the opportunity to discover European Old Master paintings of international importance here in Sussex is remarkable and he is deserving of our thanks. This accessible and jewel like exhibition is a must see and runs at Petworth House until 6th March 2016. Tickets for the exhibition are just £12 (including National Trust members). To book tickets telephone 0844 249 1895. By Revd. Rupert Toovey. Originally published on 13th January 2016 in the West Sussex Gazette.